Much has already been written about the wind. One of my favorite wind quotes is from William Arthur Ward who said, "The pessimist complains about the wind; the optimist expects it to change; the realist adjusts the sails." And another from Captain Christopher Shelton (from s/v Albatross and the movie White Squall): "You can't run from the wind. 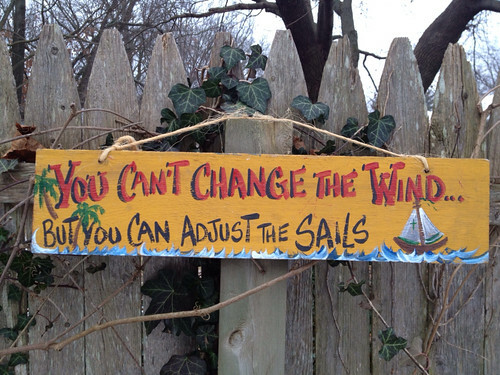 You trim your sails, face the music, and keep going." So now allow me to write a bit more about the wind, for sailing would be a lot more like drifting without it. There are a few things in life that we can't see even with our eyes wide open. God. Love. And the wind. We can see the effects of all these things, but we can't see the actual thing. However, if we allow our other senses to open up, we can feel them. It amazes me that something as cryptic as the wind has the ability to carry a sailboat thousands and thousands of miles. And lastly, I'll finish my tribute to the wind with the lyrics to Windsong from one of my favorite musicians, John Denver.